My dogs are all native Californians. Every single one of them was born in the Golden State. Princess did live in Texas for a year; but she doesn’t do well with thunderstorms so we suspect that was a factor in her journey back to California. We really don’t know. My husband is her third owner. Dude was born in the Mojave Desert. The beagle came from Northern California. Both Buddy and Peanut came from Sacramento. These are California dogs, used to basking in the sunlight and enjoying moderate temperatures. To be honest, I have to admit that snow does fall in Southern California– in Frasier Park, up in Big Bear, in the high desert. We didn’t take the dogs there then. These are dogs used to hiking in dry river beds or running on paved streets. They hunted for quail in the southern California forests and scrublands on nice fall days. We took them camping in the Sierras but only during the summer months. Their only exposure to snow came when we went to Saddlebag Lake in the Tioga Pass. If we went in late June or early July, the dogs and I would find ourselves in snow while hiking in the backcountry. Just a little. In the mountain shade. These are dogs that stayed in the house on rainy days. When I went on my early morning run, Princess and the beagle would hide if it was below 40 degrees. Princess likes to wear her jacket on cold mornings. 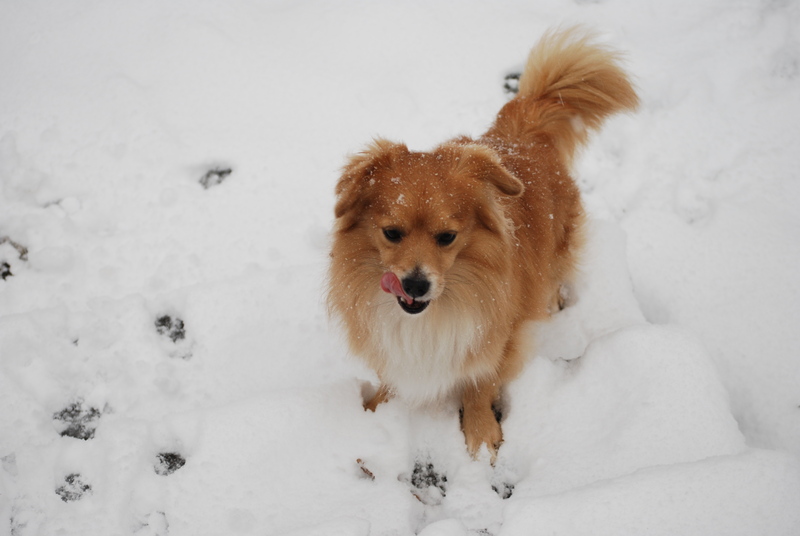 How were my dogs going to adjust to the snow? The dogs had some exposure last winter. While waiting to close escrow on our house, we lived in an apartment with the cats; they lived in a kennel where they went to doggy daycare every day. I was told that Dude liked sitting outside in the snow, guarding the fence perimeter. Princess would still play ball outside. I gave the kennel her jacket but she didn’t wear it much. I worried too much about how the dogs would react to the snow. 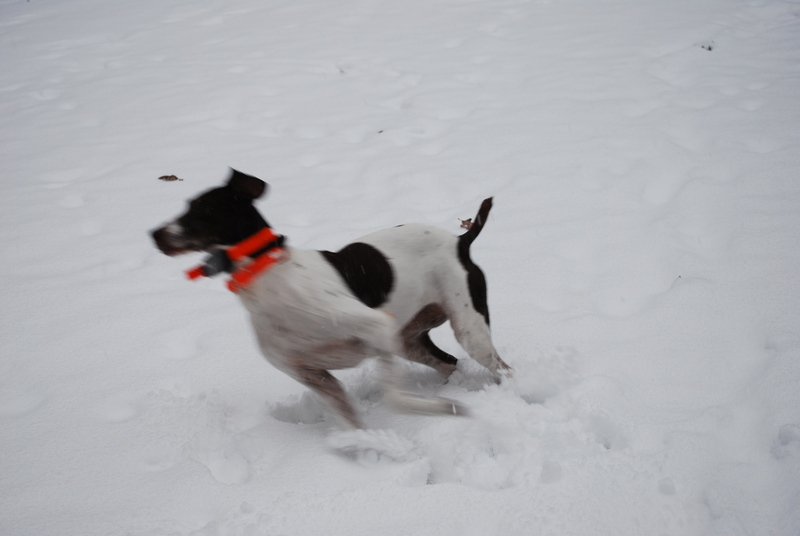 They loved the snow, leaping and running, chasing and hunting. The challenge with yesterday’s snow storm was boundaries. In a yard without a fence, in a yard where the line between the lawn and forest is now buried, how is a dog supposed to know where to stop? I think they know. 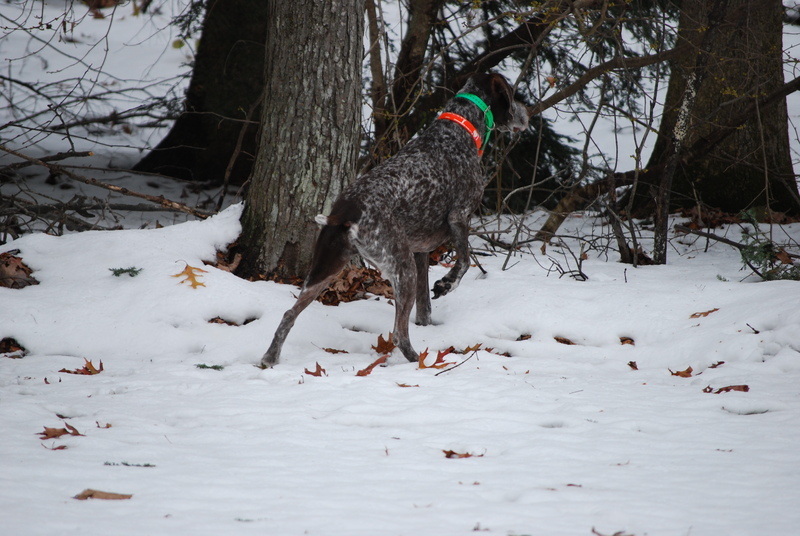 The snow becomes their excuse to run into the forest to ferret out shrews and chipmunks. (The squirrels watch from high in the trees, safe.) 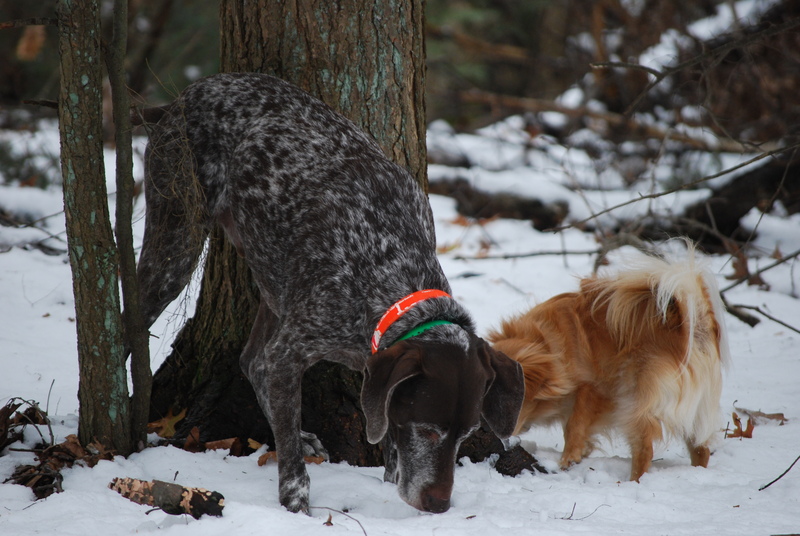 The scents must be different in the snow; the noses are down. The hunt is on. Some difficulties arise. 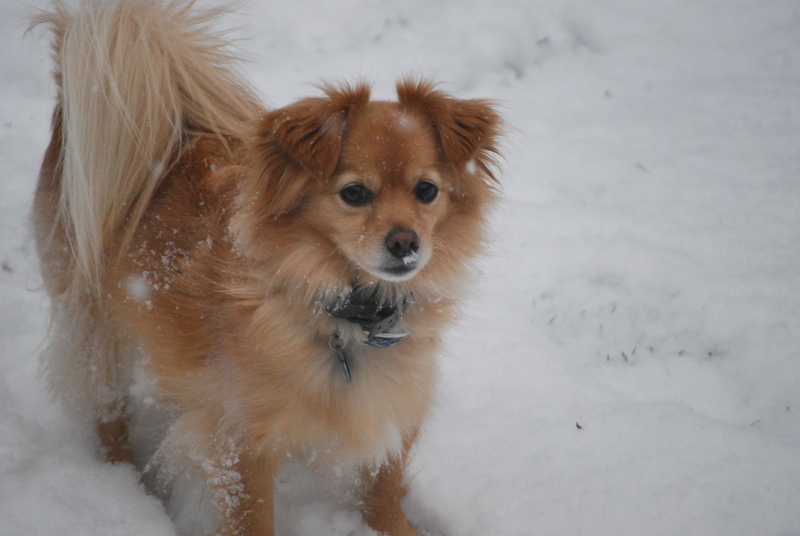 Snow clumps onto Peanut’s coat (but not Buddy’s). He tries licking it off but is unsuccessful. I didn’t have him groomed this month so I brushed him to see if that helps. It did. When Princess gets too excited, she plays too roughly with the other dogs. She does become cold after a while and willingly goes back in. Dude likes to be outside and doesn’t immediately respond to the ‘house’ command. At one point, the beagle decided that the going out in the snow was not an option so he would use the woodpile on the deck as a bathroom. I let him know that was unacceptable. This snow is melting as I write. In a few days it will be gone. At least I have a preview of the winter. 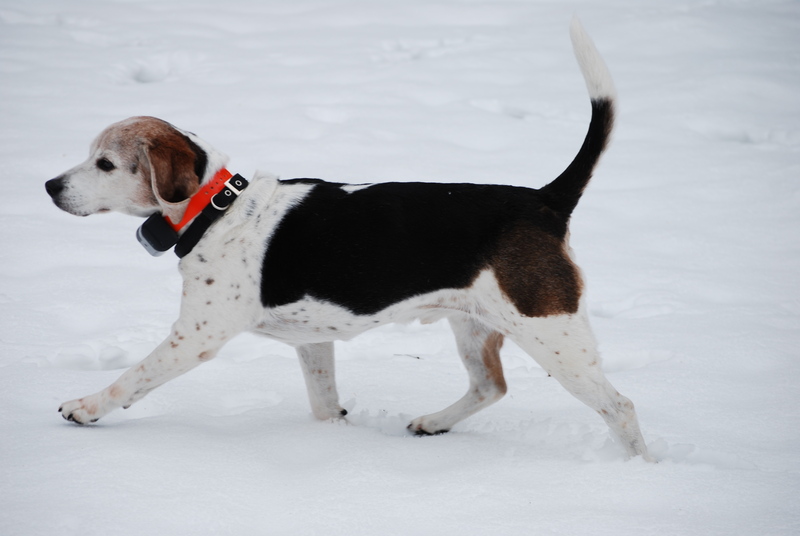 This entry was posted in dogs, everyday life, life, Life in Connecticut, New England, photography, snow, Uncategorized and tagged Beagles, dogs, German Short-Hair Pointers, mutts, small dogs, snow. Bookmark the permalink.